(Parenting.com) -- Germs. The word alone can put a room of new or expecting moms on high alert. After all, those pesky little microbes can be a big worry for parents trying to safeguard their tiny babies from sniffles, runny noses, fevers and worse. But not all germs (bacteria, viruses, fungi and parasites) cause disease. In fact, all of us have a bouquet of normal bacteria on our skin, in our mouths and in our bellies that help us stay healthy (sounds gross, but it's true). They aid with digestion and building immunities, and, believe it or not, keeping them is as important as avoiding their disease-causing germ cousins. The story of the germ is one of good versus bad, and the happy ending results from finding a balance in the approach to both. Despite Herculean efforts to keep baby's environment clean, germs happen. Most infants will have between six and eight respiratory infections (colds, ear infections, bronchitis) each year. The American Academy of Pediatrics (AAP) doesn't think a child's environment can be "too clean," so do the best you can to police your collective space. Since newborns have immature immune systems, every effort should be made to minimize their contact with bacteria and viruses that cause diseases. The big bad wolf has many friends, including respiratory syncytial virus, influenza, rotavirus, pertussis (whooping cough) and group B streptococcus. Even though it is impossible to completely control a newborn's environment, there are a few things that parents can do to limit a new baby's exposure without making themselves nutty in the process. Tell Aunt Sally with the runny nose to stay away! It's important to keep a young infant from anyone with symptoms of infection: fevers, sore throats, coughs, sniffles and sneezes. Remind excited relatives and friends that the gift of keeping their germs to themselves trumps any teddy bear or romper set. Wash your hands. A 20-second scrub with warm water and soap is the best prevention of spreading germs. It's also the single most important thing a person caring for a newborn can do. So, scrub your hands every time before scooping up your little one; ask others to always do the same. It's especially important whenever you've handled raw vegetables or meat, played with your pet, visited the bathroom or shaken someone's hand. We know, your baby is just so darn kissable. But for the love of germ prevention, keep the smooches away from her face. Saliva and mucus are two hotbeds for germs, and avoiding big wet ones on the cheek is another defense in protecting her health. Avoid grocery stores, restaurants, malls, festivals and other large crowds for the first few weeks. Bypassing the adoring, baby-loving masses and their host of pathogens will help keep your little one sniffle-free. By the time baby's immune system has strengthened (with the help of recommended vaccines) your kid has discovered his mouth. Sadly, baby's cravings for mommy's keys don't disappear quickly. In fact, putting things, including his soiled hands, in his mouth will continue into toddlerhood and is a normal way for baby to explore and learn about his world. 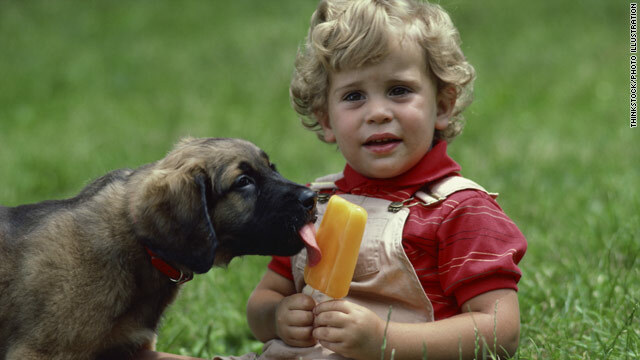 However, it's best to keep your little one from tasting too many dirty doodads, especially when they've previously hit the pavement, another child's mouth or Fido's doghouse. We know this isn't easy, especially since baby's world has grown to include playgrounds, play dates and trips to grocery stores, banks and other germy wonderlands. So keep these guidelines in mind to help minimize the guesswork and baby's overall germ exposure. At about 8 to 12 months, teach your tot how to wash his hands. Regular soap and water does the trick (antibacterial types have not proven more effective). Get in the habit of washing baby's hands before he eats (including snacks) and after diaper changes, visits to the playground, petting an animal or coughing, sneezing or wiping his nose. If soap and water are not available, alcohol-based gels or wipes will suffice. Most of the time, washing toys with soap and water and letting them air-dry every couple weeks is fine. But when there is a gaggle of kids manhandling baby's toys (or a play date with another drooly baby), the risk for bacteria rises. These times call for a regular household bleach wash (one-quarter cup of household bleach to one gallon of water or one tablespoon of household bleach to one quart of water). Wash, rinse thoroughly and air-dry the goods. Fuzzy toys are germ magnets and are harder to clean, so you might want to put these away during the next play date. Vaccinations are not just important for baby. Make sure both parents and caregivers are up-to-date on their immunizations as well. Most important are the influenza vaccine, which everyone older than 6 months should receive each fall, and the Tdap (tetanus, diphtheria and pertussis) vaccine, which is given to adults as a booster every 10 years. Consult your physician about when you're due. Sing the alphabet song while you help baby wash his hands. The song is just long enough to get his tiny mitts squeaky clean. Disinfect bath toys frequently or avoid buying ones that collect water and breed mold and bacteria. The five-second rule is a myth Bacteria and salmonella can live up to a month on surfaces, and it takes less than five seconds for them to adhere to that juicy piece of peach that fell on the floor. So, sorry to say, it's time to put the peach, and the five-second rule, in the trash.